 Our mother and grandmother always served olive oil and vinegar in cruets, so people could serve themselves at the table. They’re becoming a thing of the past, as salads come pre-dressed from the kitchen—or as more people use commercial dressings (photo courtesy Flavor For Life). 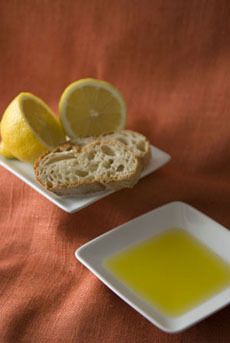 The easiest switch is to serve EVOO with bread, instead of cholesterol-packed butter. You can add a splash of lemon juice or seasonings to enhance the oil—that’s what commercial bread dippers do (photo THE NIBBLE). For tastier homemade chips, use olive oil instead of canola or other neutral oils (photo courtesy My Name Is Yeh | California Olive Ranch). It’s still the month for resolutions, our annual hopes of changing parts of our lives for the better. Adding more extra virgin olive oil to your life is one way, switching out less healthy fats. 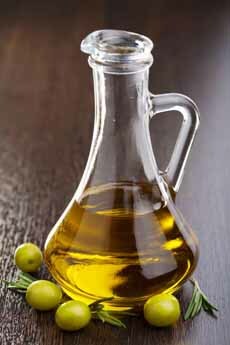 EVOO is a heart-healthy fat, high in polyphenols. It can lends extra flavor and textures to your favorite dishes. Olive oil is a versatile ingredient, and can replace other fats like butter and canola oil in almost all recipes, for a health boost. Think bread with an EVOO dipping oil instead of butter. Eat salad with an EVOO vinaigrette instead of creamy, heavy dressings. Use it as a pasta sauce. Here are three suggestions from California Olive Ranch to swap in extra virgin olive oil. Using olive oil in baked goods may seem strange to Americans, but it’s the fat used in Greece, Italy, southern France and the other olive oil-rich lands around the Mediterranean. EVOO adds a nuanced flavor to sweet treats, keeps cakes moist, and adds a luscious crumbly texture to crumbles. Some baking recipes will call specifically for extra virgin olive oil, but you can also substitute olive oil in recipes that call for butter for the flavor and health benefits. Homemade vinaigrette takes two minutes to make, at a mere fraction of the cost of buying bottled dressing. And no bottled dressing can beat the taste (or the quality of ingredients) of a simple homemade vinaigrette. Here’s a recipe that uses lemon juice instead of vinegar. It’s more sprightly. You can substitute lime juice, which is a classic Mexican variation. Just place all ingredients in a sealed jar and shake to combine. Is so easy: How can you not make your own vinaigrette? It’s not true that you shouldn’t cook with extra virgin olive oil. It’s perfectly suitable for frying, poaching and sautéing. The accurate statement is that you shouldn’t cook with your $20 bottles of it—save the pricey bottles for salads or drizzling. 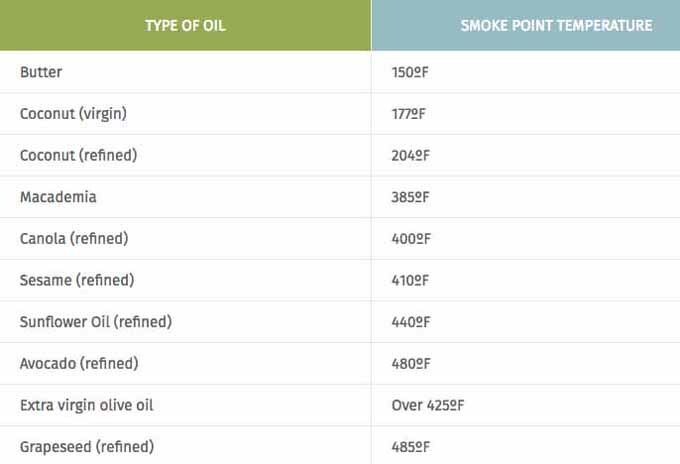 Quality olive oil has a high smoking point upwards of 425°F, well above the ideal temperature for frying food of around 350°F. See the comparison chart below. In addition to frying eggs in olive oil, EVOO is a great choice for a simple stir-fry. 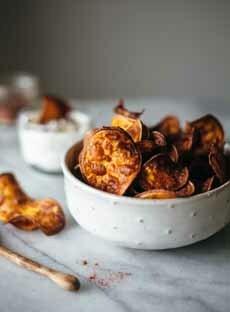 Can we entice you to make this recipe for Olive Oil Sweet Potato Chips? Chart courtesy California Oil Ranch. *A high quality oil loaded with antioxidants will hold its form longer, while a lower quality oil with high free fatty acid content will smoke at a lower temperature.